The Samsung Galaxy Fold is supposed to represent the future, the future of smartphones and tablets to be precise. But just two days after Samsung begun handing out review units in the US, multiple journalists have begun experiencing severe problems with the display. Not one, not two, but FOUR reports of issues! The first to report a problem was Dieter Bohn of The Verge. Like many others he received his Galaxy Fold unit on Monday, but by yesterday evening the Galaxy Fold’s display already presented a tiny, mysterious bulge that sat along the crease in the middle. It’s unclear how this bulge developed – it could be a bit of debris or a defective hinge that is poking into the display – but by this morning it had result in both a vertical and horizontal line of dead pixels along the OLED panel. Shortly after Bohn’s admission, CNBC’s Steve Kovach took to Twitter to showcase similar problems. However, in this particular case a thick strip of pixels directly above the crease have permanently blacked out. The left side of the Galaxy Fold’s display also flickers constantly, essentially making the larger display unusable. In addition to these two reports, Mark Gurman who writes for Bloomberg also spoke about some even bigger issues. In his case, the pixels on the Samsung Galaxy Fold's display have been gradually turning black. Last night, for example, just over half of the display was unusable, but currently only a small area of the panel along the right side continues to work. On a related note, Gurman noted that tapping the screen with his the tip of his finger leaves a permanent indent which is caused by his fingernail coming in contact with the display. Lastly, popular YouTuber Marques Brownlee (MKBHD) reported his own set of issues. 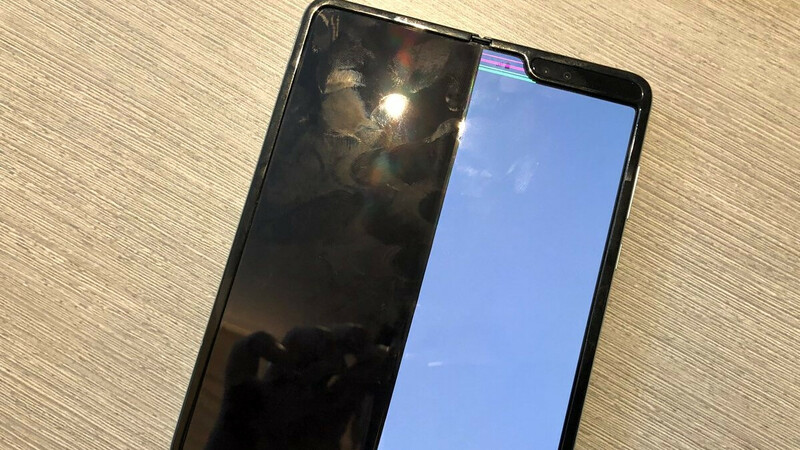 In this case, Brownlee proceeded to remove the Galaxy Fold's polymer layer, which at first glance looks like a regular screen protector, but shortly into the process the entire display turned black and stopped working. What's causing this severe issue? Samsung is yet to comment on the matter officially – we have contacted the company but are yet to receive a response – so at this point the cause of the problem remains purely speculation. However, the separate reports do suggest it may have something to do with the Galaxy Fold's polymer layer on top of the display. The South Korean giant itself says the polymer layer shouldn't be removed, but from the look of things reviewers didn't see the warning on the Galaxy Fold's plastic wrap. Mark Gurman, for example, managed to remove the entire thing without a hitch, but later experienced severe problems with the panel. Marques Brownlee, on the other hand, experienced problems as soon as he started to peel off the layer. On the opposite end of the spectrum, The Verge and CNBC have revealed that they didn't remove the exterior layer, nor did they attempt to. Nevertheless they still experienced some pretty big problems, so perhaps some debris got caught beneath the layer – that would explain the bulge seen on The Verge's unit. In terms of what will happen moving forward, Samsung could choose to delay the Galaxy Fold by an undetermined number of months in order to iron out any issues. Alternatively, it could either scrap the model entirely or move forward as if the issue doesn't exist. But in the meantime, all of these reviewers have either received or will soon receive replacement units. UPDATE: We have received the following statement from Samsung regarding the Galaxy Fold's display issues. Don't buy ANYTHING in its first iteration, ever. Galaxy, iPhone, Tesla... doesn't matter. Wait for the kinks to get ironed out before you buy stuff like this! Except they wasn't first. What rush? The product has been in R&D for at least 2 years. It's amazing how, when a product is released and it has problems, LIKE ALL NEW PRODUCT USUALLY DO, all of a sudden they RUSHED it to market to be first. Except Samsung wasn't first. I'm curious, I want you to define rush. Since you don't own such a company that makes products on this level or even close, how long should a product be in R&D for you to consider it not rushed? Because rushed to market to me would be, they thought of it today, and its gonna be release in 30 days or less. Maybe you just rattled off the first thing that came to your head. But using the word rushed to market for a product that has been in R&D for a couple years is just dumb.\ t certainly isn't ready for prime time, but it wasn't rushed. Your understanding of the term "Rushing a product to market" is fundamentally flawed. There is no defined time limit for any and all markets that once crossed, a product isn't rushed, It could have taken them 20 years to develop the phone, but when it comes down to it, if they fail to properly develop the device to ensure it meets consumer expectations and has a failure rate as rampant as this device, then it's clear that they failed to perform adequate quality tests in order to sell units. I'm sure that most times this is done to appease stock shareholders, but when a product that is not ready for use and needs more time to fine tune, but is released anyways, that is what it means to rush something to market. Also, please provide me the brand and model name of another phone that's released. I don't follow phones news as closely as I have in the past, but I'm pretty sure there's no comparable phone from a reputable company that is readily available for consumers to buy. Android P in early beta was much better than Android O... That's not the case for Android Q, the beta version of that OS is a disaster! lol, but it's something I did to my own phone. Phone is perfect. It's just not idiot proof. Two of the four failed phones didn't fail as a result of user error - they just failed. How is that perfect? Almost every company would go bankrupt if nobody bought the first batches of their products. While your logic is should, following it would have us still living in the dark ages. Lot of people out there to be a first generation testers, I am not going to be one of them. WOW, I agree with you. I was very interested in this phone even though I had no plans to buy a first generation. First generation anything is always the experiment run. That's not entirely true. The only first gen devices that shoudl have such issues, liek in this case; is a device that has never been done. But this doesn't explain how that after 3 years it took appel to finally get teh Apple Watch to market, how come it wasn't even as good as Samsung 1st gen watch, that came out 3 years earlier? and samsung had release 3 more models that significantly improved in that same 3 years. Apple made wireless earbuds for the first time. Well wireless earbuds have been around for quite sometime. In fact, they bought a company that makes far better ones than the Airpods. What's the excuse for that? In fact the Beats X would have been perfect as wireless buds and they could have included them with the iPhone X, considering it was a $1000 phone. even Samsung release improved headphones after buying HK and the phone it came with wasn't even $1000. How on earth did this become an opportunity to bash Apple? Take it back am sure they will replace it. Question is: how long is it going to take them to replace your item? They just reported being sold out of them so there would be a supply issue. And if it turns out that it was a manufacturing issue that caused it, that means they have to stop assembly and fix the problem and restart it again. I am sure after this they wont have a problem replacing a lot of them. There is going to be a lot of cancellation I bet. It's not about replacing it, it's about the fact that the phone is getting damaged less than few days of using it. I was excited about this phone, but it's so worrying that problems like this are showing up this soon, kinda makes me skeptical about Samsung's claims that they have tested their hinge and the whole mechanism hundreds of thousands of times. But they were sent review units, which easily could have been defective ot begin with. That's why they were sent for free. That doesn't mean the final product still has the same issue. Am sure Samsung is aware of at leats 2 of these potential issues. Which is why it clearly says on the box...DON"T PEEL THE LAYER OFF THE SCREEN. Which is exactly what a couple of them did. One fact is for sure. if you set out to break a phone, you can and you will. It looks like that's exactly what they set out to do. Sending potentially defective units to the press who will be reviewing your product and reporting the results to the world? That's a suicide move. If anything, Samsung gave these extra attention. And apparently the warning about peeling the screen wasn't on the review units - Samsung figured it wouldn't be an issue because reviewers should be savvy enough to understand not to do that. They have said they'll be sure it's very clear to retail units that go out to buyers. But after a single day of usage? That's a sign of a serious defect. The Galaxy Note 7 was a catastrophe for Samsung, and that device had a fewer percentage of users impacted and defective units were not blowing up on day 2. For the debris under the display, they will replace them for sure For being an idiot and removing the top layer of the display, nope, if you buy a retail unit and try and explain that to Samsung they'll just laugh at you, and rightfully so. Hopefully they correct this before launch, but they may need to postpone launch date depending on how many models/units are affected. Launching this no is a big mistake IMO After this has happened. They need to cancel pre orders and get this fixed. AGAIN...these were review units which were likely defective to begin with.